Photograph of a train called "Boro-den" (rag train) abolished in 1962. A recostruction of the armour which was a family treasure of the Kai Genji clan . A group of 80 high school students from the State of Iowa, the sister state of Yamanashi, visited the museum. 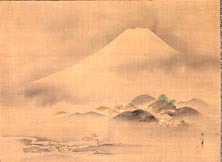 Copyright © 2005-2010 Yamanashi Prefectural Museum, All rights reserved.